Includes same-day delivery and set-up, or we'll ship it free via FedEx Ground anywhere in the United States. The ResMed AirSense 10 AutoSet is a premium auto-adjusting pressure device with integrated humidifier, cellular connectivity and advanced event detection. The AutoSet algorithm used in the AirSense 10 AutoSet is one of the most clinically published in the field of sleep-disordered breathing. It works to automatically adjust to each patient's therapy pressure as their needs change – hourly, nightly and from season to season – to deliver the patient's ideal, lowest therapy pressure. ​Advanced event detection identifies central sleep apnea, respiratory effort related arousal and Cheyne-Stokes respiration events to provide treating physicians valuable insight into the continued health of your patients. 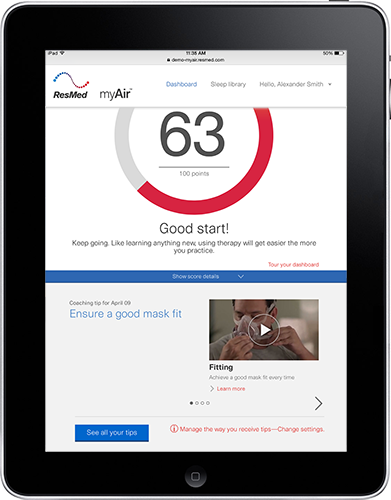 Includes MyAir™: Take your new beginning in great sleep to the next level with myAir, an online support program and app that is included with any ResMed Air10™ device and automatically sends your CPAP machine data to your computer or smartphone. It lets you know how you slept the night before and helps you stay on track throughout your sleep apnea treatment journey. Coaching and reinforcementStarting CPAP therapy can be a challenge. 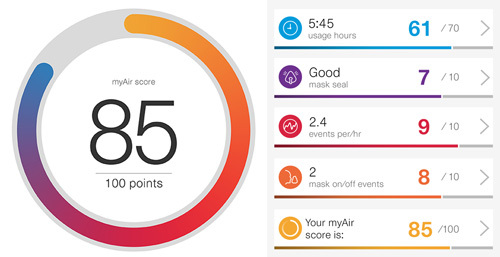 But with myAir, you have a partner as you work towards a healthier, happier life. Delivered via email or text, personalized coaching and reinforcement messages can help you get the most out of your sleep therapy. We cover all of South Florida, including: Aventrura, Bal Harbor, Boca Raton, Coconut Grove, Cooper City, Coral Gables, Coral Springs, Davie, Delray Beach, Ft. Lauderdale, Hallandale, Hialeah, Hollywood, Key Biscayne, Miami, Miami Beach, Miami Lakes, Miami Shores, Miami Springs, Miramar, Pembroke Pines, Plantation, South Miami, Sunrise, Wellington, Weston & More.